During a corporate flight, as the pilots climbed the airplane to flight level 180, both electrical generators failed and would not reset. The pilots attempted to troubleshoot the problem but could not regain electrical power. The airplane's battery power was rapidly deteriorating, so the pilots declared an emergency and diverted to the nearest airport. Due to the loss of electrical power, the pilots lost communications and had to manually extend the landing gear. They could not verify, with air traffic control tower personnel, if the landing and nose gear were extended and locked. The pilots made a forced landing with the nose landing gear not fully extended, causing the airplane to skid on the forward fuselage after touchdown and substantially damaging the engines. Postaccident examination of the airplane revealed the right generator current limiter had failed. A mechanic connected a battery to the airplane, and the left propeller immediately began to rotate. The mechanic determined that there was uncommanded voltage to the left starter, which was caused by a failure of the left starter relay when the engine was started before the flight. During the flight, the right generator was managing all of the airplane's electrical load, the cumulative electrical load exceeded the capacity of the right generator current limiter, and the generator failed. At that point, the airplane's electrical load was only being supplied by battery power, which was quickly depleted. Postaccident examination of the nose landing gear did not identify a mechanical reason to explain why the nose landing gear did not extend during the pilots' emergency landing gear extension procedure. The failure of the left starter relay during engine start, which resulted in a loss of electrical and battery power during the flight and led to a forced landing with the nose landing gear not fully extended, causing substantial damage to the engines. On January 19, 2018, about 1630 central standard time, a Swearingen SA227-TT airplane, N6UP, had an electrical malfunction during climb, and the flight crew executed a forced landing to Ellington Airport (EFD), Houston, Texas. The two pilots and two passengers were not injured, and the airplane sustained substantial damage to both engines during landing. The airplane was registered to and operated by AIRCO JN LLC, Freedom, Oklahoma, as a Title 14 Code of Federal Regulations Part 91 corporate flight. Visual meteorological conditions prevailed at the time of the accident, and an instrument flight rules flight plan had been filed. The flight departed Beaumont, Texas, at 1515, and was destined for Uvalde, Texas. According to the pilots, during climb about 18,000 ft, both generators failed and would not reset. The pilots attempted to troubleshoot the problem and could not regain electrical power. The battery power was rapidly deteriorating so the pilots declared an emergency and diverted to EFD as the nearest airport. Due to the loss of electrical power, the pilots lost communications and also had to manually extended the landing gear. They could not verify if all the landing gear were extended and locked with the control tower personnel. During the forced landing, the nose landing gear was retracted, and the airplane skidded on the forward fuselage after touchdown. Due to the nose gear being retracted during the landing, both propeller assemblies and engines sustained substantial damage. 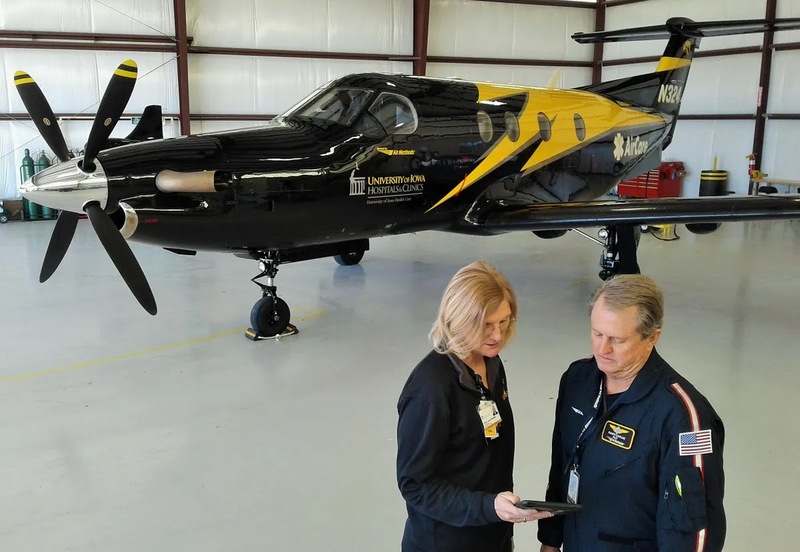 Examination of the airplane by Federal Aviation Administration inspectors and a mechanic revealed the right generator current limiter was failed (blown). The mechanic connected a battery to the airplane and the left propeller immediately began to rotate. After troubleshooting, the mechanic determined there was uncommanded voltage to the left starter which was caused by the left starter relay that failed at the engine start prior to the flight. During the flight, the right generator was managing all the airplane's electrical load, and the cumulative electrical load exceeded the capacity of the right generator current limiter and it failed. At that point, the airplane electrical load was only being supplied by battery power. According to the mechanic, on January 2, 2018, the emergency landing gear extension was successfully tested during the airplane's most recent inspection. During the postaccident examination, a mechanical reason for the nose landing gear not extending during the pilots' emergency landing gear extension procedure could not be determined.